Tuesday night was Leesburg Vice Mayor Suzanne Fox’s turn to launch her bid for a second Town Council term. Fox was joined by friends and supporters at Foxridge Park, where she looked back on some of the accomplishments during her first council term and laid out her reasons for seeking another four years on the dais. Former state delegate Randy Minchew introduced Fox, and called her a “great model of consistency” on the council. U.S. Rep. Barbara Comstock (R-VA-10) also pointed to Fox’s professional life outside of council as a wedding planner and officiant, as someone who brings people together, much like she does in her government work. When she ran four years ago, Fox said, it was about a desire to serve. On reflection, she said serving on the council during her first term was even more about learning. Fox referred to issues she is proud to have worked on—including telecommunications infrastructure; traffic improvement, for which she served on a committee of the Northern Virginia Transportation Authority; and reducing burdensome regulations. As the town continues to grow, Fox emphasized the council’s need to ensure that each land development application is the right “fit” for the town. “And if it doesn’t fit, don’t pass it,” she said. Fox addressed her reasoning for not seeking a political party endorsement this go-around. 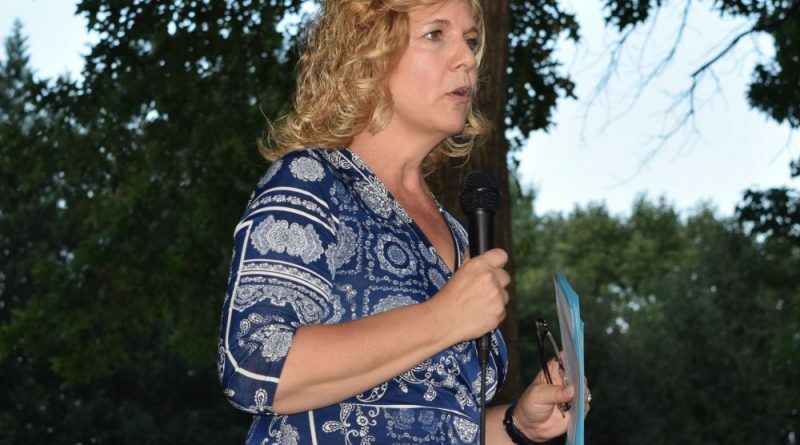 Four years ago, she sought and received the endorsement of the Loudoun County Republican Committee, but has become the second candidate in this year’s race, along with mayoral candidate Councilman Ron Campbell, to eschew an endorsement. She pointed to the “divide” she has seen from the federal level on down to the local level. To close, Fox recited two quotes that inspired her, from noted figures on both sides of the political aisle – Loudoun County Chairwoman Phyllis Randall (D-At Large) and conservative political activist Jeremiah Lorrig. Both quotes encouraged looking beyond political parties, not seeing those with opposite beliefs as enemies, and encouraging a dialogue among all in elected public service. Suzanne is such an asset to the Town Council! She listens (a rarity these days) and votes based on what the citizens of Leesburg want, not based on what staff, political party, or others may demand. She is a true public servant. Wow, roll up your pant legs cause it is deep out there in Fox land. Minchew called her consistent because she always votes for the new housing projects he represents. Fox says if it don’t fit the new development don’t pass, well everything must fit cause she has not turned down a single new housing development, not one they all fit according to her. She is correct that her first term was about learning, but she seems to not be that much further ahead then day one. She has learned how to be a quick talking politician like those we don’t like. She is working to get Ron Campbell republican votes and he is working to get her democrat votes. Then in October she will accept the Gop endorsement and get on the sample ballot. If she is honest she will tell the GOP that she does not want to be on their ballot at all even if the endorsement is not sought by her. But she will take it because that is the plan where she presents herself as the reluctant candidate. She will have the her own help at the polls and maybe teamed up with Campbell, and the GOP help. At the August meeting of the LCRC Fox was offered the endorsement she has been seeking. She went through a recruitment process just like all other candidates. Then she was presented before the whole committee for a vote. But when Dunn was endorsed without question by the whole committee that messed up Fox’s plans. She can’t openly work against her parties running mate Dunn, and help her voting partner tax hike and big government friend liberal democrat Campbell. Just to remind you where we are in the story, Fox sought endorsement by going through the recruitment process, was presented to the whole LCRC at their Political PARTY meeting to be voted on, then the brains of the operation stepped in, Bill Fox. You know him as the one time school board member who fought with parents over their kids riding safe busses instead of walking to school along unsafe bust streets. When that Bill Fox speaks for his wife at a politial party meeting about candidate endorsement and goes into the most disjointed speech about the need for non-partisanship and not taking the endorsement. Wakeup GOP cause you are being played! Fox (either one cause they seem to be one in the same) is playing the reluctant candidate who will accept a late endorsement in order to get max help from all. But between now and election day she will hurt the chances of endorsed candidates in order to work with “independent” liberal democrat Cambell. If the GOP really looks at her record they will find a lot support for Randy Minchews business interests but not conservative interests of less government and less taxes. And her supporting food trucks is not a conservative issue but her voting AGAINST 2nd Amendment rights is. Suzanne was appointed Vice Mayor by her peers. This speaks volumes about her ability to work with people and reach solutions for the betterment of Leesburg and its residents. Her thoughtful and common-sense approach to town issues has served us well. The huge turnout of supporters at her kick-off event confirms what we all know…Suzanne is well liked and well respected by all. Every town should be so fortunate to have a Suzanne Fox on council.